After almost six years of litigation, including securing a historic appellate court ruling in 2015 rebuking the New York Police Department’s discriminatory surveillance program, the Hassan plaintiffs finally reached a landmark settlement with the NYPD. The settlement makes it clear: simply being Muslim is not a basis for suspicion — or a basis for surveillance. This settlement marks a monumental victory for American Muslim communities who have demanded fair and equal treatment by law enforcement. The Hassan plaintiffs are incredibly courageous Americans who were willing to step forward and stand up for their rights and the rights of all Americans against the largest, most powerful police department in the country. Like civil rights trailblazers Rosa Parks, Linda Brown, and others before them, the Hassan plaintiffs have fought systemic discrimination — and won. Read details of the entire settlement here. 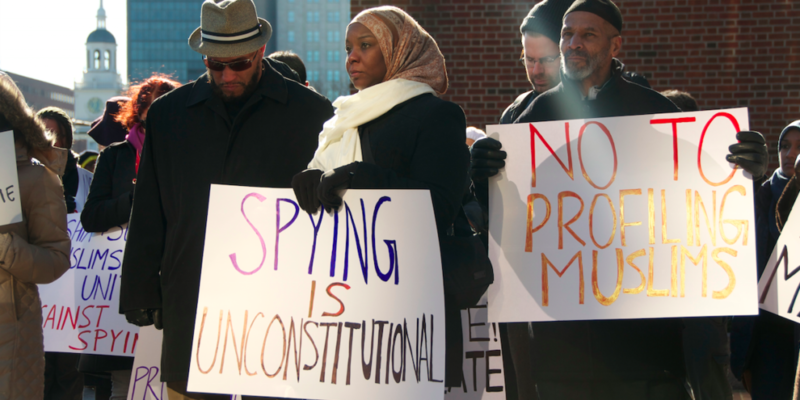 A diverse group of American Muslim plaintiffs filed suit to end the New York Police Department’s invasive and discriminatory spying program. The first legal challenge against the NYPD for intrusive practices targeting American Muslims, the lawsuit seeks an immediate end to the unlawful surveillance and the purging of files maintained by the NYPD. As documented by the Associated Press, the NYPD has been conducting unlawful surveillance of innocent American Muslims simply because of their faith. American Muslims were targeted in New York City, as well as in towns, mosques, businesses, and college campuses throughout the northeast, including New Jersey. Records show that the NYPD took copious notes on the details of American Muslims’ daily lives. The plaintiffs in the lawsuit are as diverse as the American Muslim community itself: they include a decorated U.S. Army reservist, a small business owner who is also a Vietnam veteran, students and imams. On October 13, 2015, the U.S. Court of Appeals for the Third Circuit issued a comprehensive and stirring decision in the case Hassan v. City of New York, recognizing that New Jersey Muslims who have been subjected to the New York City Police Department’s program of blanket, suspicionless surveillance stated a valid claim of discrimination on the basis of their religion. The decision reversed a district court ruling dismissing the case. Currently in his third year at Rutgers University – New Brunswick, Moiz is focusing his studies in molecular biology and biochemistry and anticipates receiving a Bachelor of Sciences degree in 2014. Since his faith is important to him, Moiz stays active within the Muslim community at Rutgers by attending weekly Muslim Student Association (MSA) lectures. Recently, Moiz was elected Fundraising Head for his university’s MSA chapter for the upcoming school year. He is the Convener of the Council of Imams in New Jersey, a body of Muslim Leaders from various mosques and centers located in New Jersey who cooperate to develop and implement initiatives to improve the quality of life of the citizens in the communities they reside. He also is a co-founder of the Newark Interfaith Coalition for Hope and Peace an organization of diverse faith leaders working to reduce violence in the City of Newark. As a consultant he serves as a director on several boards in addition to conducting lectures, workshops, counseling, educating and training people in organizational and project management, ethics, moral guidance, personal and professional management, social responsibility and how to achieve ethically, intellectually and materially balanced lives. Imam Wahy-ud Deen Shareef is also the proud father of four children and seven grandchildren. Served as Engineer Project Manager for Kraft/Nabisco Foods for 25 years. President and CEO of Shareef Professional Services LLC, a consulting company assisting groups with the process of project development and management. Co-founded Waris Associates Inc. to address community concerns about education, economy, and culture. Specialist Farhaj Hassan was born in Chicago and grew up in Central New Jersey. Farhaj resides in New Jersey and focuses on operational security for the Army. He has done a tour in Iraq as part of the US Army 304th Civil Affairs Brigade, and has earned the Army Service Ribbon, Global War on Terrorism Expeditionary Ribbon, National Defense Ribbon, Iraq Campaign Medal, Good Conduct Medal, three Army Commendation Medals, Army Achievement Medal, Combat Action Badge. Conducted medical assessment and provided security in a humanitarian mission to Haiti with Imamia Medics International after the 2010 earthquake. Worked as an EMT for DBO – Pro Care Patient Transport and Ambulatory Services. Member of Iraq Afghanistan Veterans of America, the Civil Affairs Association and the US Green Buildings Coalition. Abdul Kareem Muhammad is the Resident Imam of Masjid Al-Haqq, and Director of Education of the Clara Muhammad School, Newark, New Jersey. Imam Muhammad is a member of the Northeast Regional Imams, Council of Imams in New Jersey, and the Northeast Regional Education Committee. He is the formal Principal, Vice-Principal, Instructor, and Dean of Boys for the Muhammad University of Islam in Newark, New Jersey. Imam Muhammad is the formal Chaplaincy Supervisor for the Department of Corrections in New Jersey, and is a member of the American and New Jersey Chaplains’ Association, and Convener for the Interfaith Dialogue Committee of Newark, New Jersey. Imam Muhammad is a graduate of Saint Augustine’s College in Raleigh, North Carolina, where he earned a Bachelor of Arts Degree in Education. He is married to Kareemah Muhammad, and is the recipient of numerous awards for outstanding Community Service, and performed Hajj in 2004. Find out what national and local government and community leaders are saying about NYPD’s surveillance program. Muslim Advocates files lawsuit against the NYPD for racial and religious profiling of Muslims in New Jersey. Representative Rush Holt, D-N.J., and Representative Keith Ellison, D-MN, introduce a resolution proposing to end NYPD programs that had enabled officers to conduct surveillance in mosques and venues as well. Muslim Advocates respond to White House counterterrorism adviser John Brennan’s endorsement of racial and religious profiling by the NYPD. Muslim Advocates and other civil rights organizations urge U.S. Attorney General Eric Holder to open an investigation of the NYPD. Senator Robert Menendez requested the U.S. Attorney General Eric Holder to investigate NYPD surveillance in Newark. AP report states that the NYPD identified 263 “hot spots” in New York City. Representative Rush Holt, D-N.J., requested the Justice Department investigate into the NYPD surveillance of Muslims. AP report published stating an NYPD Demographics Unit was established to “map ethnic neighborhoods” and communities associated with “ancestries of interest” in New York, New Jersey, and Connecticut. NYPD begins surveillance outside of its jurisdiction and in Newark, New Jersey. NYPD mapped and surveyed individual venues of Arab, Bangladeshi, Guyanese, Iranian, Pakistani, and Turkish communities within Nassau County, New York. NYPD began following Muslim Student Association websites, blogs, and forums of universities within New York as well as New Jersey. Investigations within the five western towns of Suffolk County, New York began. NYPD officers placed mosques, cuisines, and meat stores under surveillance, taking note of the ethnicity and faith of the owners as well as people visiting these locations. NYPD began surveying mosques and Muslim individuals in the New York area to speculate the potential backlash from publicizing a Danish cartoon of the Prophet Muhammad.